In 1980, a song I wrote, Another Brick in the Wall Part 2, was banned by the government of South Africa because it was being used by black South African children to advocate their right to equal education. That apartheid government imposed a cultural blockade, so to speak, on certain songs, including mine. Twenty-five years later, in 2005, Palestinian children participating in a West Bank festival used the song to protest against Israel’s wall around the West Bank. They sang: “We don’t need no occupation! We don’t need no racist wall!” At the time, I hadn’t seen firsthand what they were singing about. For the people of Gaza, locked in a virtual prison behind the wall of Israel’s illegal blockade, it means another set of injustices. It means that children go to sleep hungry, many chronically malnourished. It means that fathers and mothers, unable to work in a decimated economy, have no means to support their families. It means that university students with scholarships to study abroad must watch the opportunity of a lifetime slip away because they are not allowed to travel. Artists were right to refuse to play in South Africa’s Sun City resort until apartheid fell and white people and black people enjoyed equal rights. 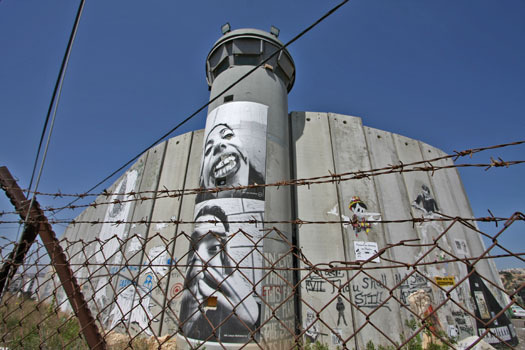 And we are right to refuse to play in Israel until the day comes – and it surely will come – when the wall of occupation falls and Palestinians live alongside Israelis in the peace, freedom, justice and dignity that they all deserve.